The Huddersfield Geology Group developed out of adult evening classes which I started teaching in 1983. Classes were held in Holmfirth, Almondbury and Slaithwaite education centres. We decided to continue meeting to enjoy field trips and talks, though many of the group had achieved the exam qualifications that they wanted.. We met regularly at Huddersfield New College during 1993/1994 to research the geology of the Huddersfield area. From this research came enough material to publish a booklet on Huddersfield’s urban geology. We devised two geological trails around the centre of Huddersfield and after a year of editorial meetings and fund-raising we were able to publish the Building Stones of Huddersfield in September 1994. It became clear that in order to publish a booklet, we needed to become a constituted society and in 1993 we became the Holmfirth Adult Education Geology Group. To get the group started, each member gave £25 which helped with the publication of the booklet and the use of a meeting place in Huddersfield. The first AGM was held on September 18th 1994 for the election of officers and discussions about how the group would function. By that time, we had plans to survey geological sites in Kirklees and to write a guide to the geology of the Huddersfield area. On Monday 23rd October 1994 the first HGG meeting was held in the upstairs room at the Albert Hotel, Huddersfield and members brought along interesting rock and mineral specimens. Of that first group of people, only Vilma Oreniss and Susan Williams are still regular attenders at HGG meetings. 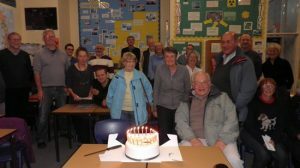 Brian and Jean Farrington became involved when the Slaithwaite evening classes started in 1988 and both of them worked hard on the booklets, as well as running field trips and giving talks. Brian taught geology for Huddersfield U3A for many years after he retired. We began a programme of monthly meetings and field trips. During the first year we had talks from an engineering geologist, a Yorkshire Water speaker who told us about reservoirs and William Naylor, from Naylor Myers of Crosland Hill quarries. The group visited Morton Wood near Hepworth, Glodwick Quarry in Oldham, South Ferriby cement works, Cliffe Castle in Keighley and went on a week’s trip to Mull in April, as well as taking some local walks. We also prevailed on Murray Mitchell to take us around the building stones of Leeds in January 1995, a trip he repeated several times for HGG. The group began to meet regularly on Sunday mornings for field trips in the Huddersfield area, in order to research the Huddersfield Rocks and Landscapes booklet which was published in 1998. By 1997 it became more appropriate to call ourselves the Huddersfield Geology Group, as we had lost contact with Huddersfield Technical College. As numbers grew, our meetings moved to Greenhead College. Since then HGG has continued the format of day field trips and evening meetings with speakers. It is good that HGG residential field trips have been reinstated after a gap of some years, during which HGG members came on Greenhead College trips to the Lake District, Arran and Iceland. Attendance at evening talks has increased over the years, though fewer people now come on field trips..
Twenty years on, Huddersfield Geology Group is thriving. Good luck to the present committee and I look forward to celebrating further anniversaries.